The students blazed through "exultant" and "babushka." Things got a little rockier around "miasma," "sacrosanct" and "pugilist." But it took words that would send spell-check into conniptions to really trip up the sixth-, seventh- and eighth-grade champion spellers yesterday. How would you do against "obstreperous" (to stubbornly resist control) or "adumbrate" (to outline broadly, omitting details), not only spelling these tongue-twisters out loud, but with bright stage lights reflecting off your braces, your voice cracking from tension -- or possibly hormones -- as you demonstrate your verbal prowess before more than 100 strangers? Nothing, however, cowed Natasha Smith as she charged through "extirpate," "quintessence" and "calamine" to claim the title of regional spelling bee winner for King and Snohomish counties. Now the homeschooled 13-year-old has two months to prepare for the national contest in Washington, D.C. Her secret? Tons and tons of practice, and a little bit of prayer. "I was still going through (the words) yesterday," she said. She began studying back in the fall, plowing through the 3,700-word spelling list provided by the contest and others culled from the Internet and the dictionary. "I just sort of memorized them," she said. Participants came from 67 local schools to participate in yesterday's contest, held in Seattle's Town Hall. The event was sponsored by the Seattle Post-Intelligencer and an anonymous local couple. Students came from public, private and religious schools from around the region. Some wore hip cargo pants and long, sparkly sweaters, teetering up to the microphone in large, clunky shoes. Others shuffled to the front of the stage, bangs falling over their eyes. They burned through their words like superhuman spelling machines or picked carefully through the letters, drawing the crowd to the edges of their wooden benches. They looked anxiously to the announcer to learn if they'd navigated successfully through the likes of "ecclesiastic" and "cilantro." Failed attempts earned them a ding on the judges' bell and a room full of applause for their effort. Half of the pre- and young teens were out of the running by the end of round two. By the end of the fourth round, it was down to five girls and three boys. 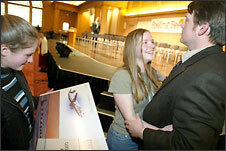 The group was quickly whittled to Smith and Danielle Sprague, an eighth-grade student from St. Francis of Assisi in Burien, who came in second place. The two sparred through some 20 words that left adults in the crowd dumbstruck. Both came close to winning earlier on, only to be stymied by such beasts as "paterfamilias" (male head of a household) and "raillery" (good-natured ridicule). Perhaps it was the tension of the match, maybe it was the hard seats, but the crowd jumped to a standing ovation when "dechlorinated" ended it all. Smith said she simply was pleased to have done better than last year, when she was eliminated in round four. But months of practice, plus instruction in Latin and Greek from her dad, propelled the eighth-grader from Burien's Manhattan Homeschool to the winner's circle. "I didn't think I'd win," she said. "I was all set to be runner-up." 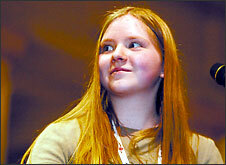 The winner of the Regional Spelling Bee Championship is 8th grader Natasha Smith of Manhatten Home School in Burien. She is being congratulated by her dad, Patrick, after the competition. On the left is her sister Hannah, 12. The winner of the Regional Spelling Bee Championship for King and Snohomish Counties is 8th grader Natasha Smith of Manhatten Home School in Burien.